Craig Sadler, Peter Broadbridge, Lee Nash, Paul Sadler, Paul Mahon, Mark Hadden, Dan Belcher, Nathan Bignall, Nigel Desmond, John Hunt, Andy Brotherton, Robert Hope, Ryan Deeney, Matt Glover, Eddy Kabran, Phil Shand, Josh Thomas, Nigel Deaves (Head Coach) Richard Allen, Isaac Cooper, Dennis Bailey, Sam Whitehead. 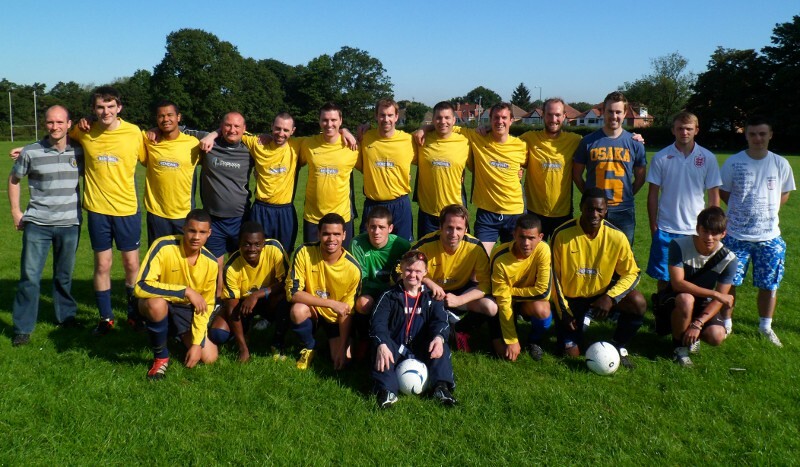 The Renewal Christian Centre football team started life in the West Midlands Christian Football League in 1996, and has been managed ever since by long standing Renewal partner and enthusiastic young football coach, Brian Follows. Under the name of R.C.C the 1996/97 season didn't go entirely according to plan. The side finishing bottom of the League with just one victory all season. The 1997/98 season proved just as difficult for an improving Renewal side, but four wins and two draws couldn't lift them from the bottom spot. Following the 98/99 season when the team was decimated by horrific injuries, the League grew sufficiently to introduce two divisions. The newly named Renewal Solihull F.C. gained promotion from the Second Division at the first attempt with an incredible 45 points. The team consolidated its position in the First Division for four seasons before crashing out in 2004, finishing third from bottom. Renewal made a stuttering start to the 2004/05 season but manager Brian Follows was un-deterred. Finishing in fifth place was all that Renewal could achieve in the WMCFL Division Two, but made history by clinching a magnificent League Cup Final victory by six goals to two against First Division runners-up Wolverhampton & Perton Churches. 2005/06 began in true Renewal style; only one win between September and December 2005 saw the side third from bottom of the second division table, hovering just above the two Sandwell clubs. But following manager Brian Follows Christmas 'Battle Cry' (not to be confused with the 'War Cry') a resurgent Renewal, in an amazingly rich vein of form, remained unbeaten throughout 2006, with eight magnificent wins and three draws. Finishing in third place and promotion back to Division One. 2007 A topsy turvey season for Renewal again: A very strong team at home but weak away. They eventually finished sixth and made it to the Cup Final for the second time, only to lose four-two to St. Mary's. 2008 Solihull seem to be on the wane again as they finished bottom of Division One. They also failed to progress past the group phase of the Cup. It will be interesting to see how they do in 2009 as Birmingham International are entering the League, effectively a second team from Renewal Christian Centre. 2009 Renewal once again were burdened by inconsistency, dallying with relegation but getting together towards the latter stages with some impressive performances. They ended the year in mid-table. Renewal have since maintained their Division Two status with mid-table finishes, sixth, ninth, sixth over the next three seasons.